Ten years after: Is Kosovo an inextricable knot? Tomorrow marks ten years since Kosovo’s declaration of independence – a pivotal event that precipitated geopolitical and juridical issues. Accordingly, when twenty-two European Union member states on February 17, 2008 swiftly chose to recognize Kosovo’s independence, it quickly affected the security situation in Europe. Not only did the event have unintended consequences for international law, but was concurrently used to justify the conflict that erupted in the summer of 2008 between Russia and Georgia, and few years later in Ukraine. Moreover, as a consequence of disagreeing with the premise, Serbia chose to reorient its foreign policy in order to receive support from Moscow – a move that would challenge European security considerably. The major rift created between Brussels and Belgrade quickly overshadowed their ongoing cooperation and soon became a major obstacle in their relationship. But what effect did these repercussions exactly have on the prospect of peace and stability in Europe, and can the Kosovo issue ever be successfully resolved? When the United States’ attention became focused on the Middle East after the September 11 attacks in 2001, in Europe there was a noticeable hesitation to deal with Kosovo’s status question as this could diminish Serbia’s democratic transformation as well as the fragile peace reached in the 1990s after the Yugoslav wars. Yet when it in 2005 became clear just how little headway had been made towards ethnic reconciliation between Serbs and Albanians under the United Nations’ six-year administration, the EU and the US backed UN talks on the future status of Kosovo as they were announced later that year. As negotiations developed into a “Troika” format consisting of the US, the EU, and Russia, it became clear that Moscow intended to support Serbia’s wish for Kosovo to remain within its borders. The reality of Russia’s veto first came into focus in 2007 when the status talks developed into the Comprehensive Proposal for the Kosovo Status Settlement (informally known as the Ahtisaari plan) for the province’s “supervised independence”. Russian officials repeatedly affirmed intentions to veto any proposal not acceptable to all sides of the negotiations, since any decision on Kosovo would set a precedent which could encourage separatism in other parts of the world, including post-Soviet Eurasia. Russia’s position on Kosovo was, therefore, based on rather complex interests and concerns – domestic, regional and global – which dominated the thinking of Russia’s political elite. Hence, Kosovo’s independence could trigger negative developments within Russia itself. Notwithstanding the emphasis placed on constructive cooperation by the EU, the Serbian government in 2008 chose to rely on Russian support and in an irredentist manner waged an active campaign to defend its territorial claim over Kosovo, including the persuasion of diplomatic initiatives, such as its successful effort to have the issue taken up by the International Court of Justice. The argument here was that Kosovo’s independence is hard to reconcile with universal legal principles, with the big dilemma being whether Kosovo’s independence should give precedence to the right to self-determination or to the principle of territorial integrity. Hence, did Kosovo constitute a precedent for other would-be states to try for independence? While self-determination is linked to the notion of human rights and the responsibility of states to advocate the individual rights of all citizens, in international law this principle has a much weaker basis than that of state sovereignty, which is considered to be the foundation of the multilateral world order. Thus, by exercising its support for Kosovo’s independence, the EU impaired its support for the multilateral legal order which it pledged to strengthen in its security strategy a few months prior to the independence declaration, while Russia on the contrary saw an opportunity to present itself as a guardian of legality in the international system by criticizing the West for its transgression of international law. The veto power wielded by Russia as a permanent member of the UN Security Council thus solidified its new role as the primary obstacle to Serbia’s territorial disjuncture, and at the same time prolonged Kosovo’s undefined status. What is more, this entangled situation was additionally impaired by the EU’s shifting and contradictory foreign policy stance. The then High Representative for Common Foreign and Security Policy, Javier Solana, in October 2006 indicated the possibility of Kosovo’s independence negatively affecting Georgia’s territorial integrity by setting a precedent for its breakaway regions of South Ossetia and Abkhazia. However, in August 2007, as aspirations of independence were looming large in Kosovo, Solana clearly announced that independence would not become a precedent for other conflicts in other parts of the world, and that Kosovo’s case was sui generis. So, why did the EU change its stance and proceed to recognize Kosovo’s independence, even though five member states opposed it? The continuation of underdevelopment in Kosovo, generated by its undefined status, was by the EU increasingly seen as an argument in favor of speeding up the final settlement of the province’s statehood. Otherwise, Kosovo would remain a black hole in the Western Balkan region propagating criminality and poverty, which in the long term would pose a problem for European security. Hence, when the EU together with the United States agreed to officially realize Kosovo’s statehood, they most likely did so more in the spirit of pursuing the “least worst” solution rather than as heartfelt enthusiasts of Kosovan independence. Moreover, while independence could not and did not resolve the status issue immediately, it did, however, help release some pressure from the issue. It principally prepared the EU to assume the post-status responsibility over Kosovo, while bringing home across Europe the realization that Kosovo is in fact a European responsibility. The preeminent test of success of the “independence solution” was, therefore, not to find a satisfactory outcome right away, but to ensure that when the status issue was completely settled, both Kosovo and Serbia would be closer to the EU than before. The settlement of Kosovo’s status should thus contribute to realizing the European perspective of Kosovo as well as the integration of the entire Western Balkan region in Euro-Atlantic institutions. What we have seen in this case is, therefore, in reality an integrationist approach to conflict resolution through the enlargement instrument, where the EU as a problem-solving entity based its reasons on a pragmatic discourse which contributed to the realization that independence was the only viable solution, both for Kosovo and Serbia as well as the EU itself. The EU acted as a progressive power and through the Ahtisaari plan did the best it could in a difficult situation in order to resolve a conflict on European territory and thereby improve its own security. Despite the fact that Russian officials agreed that Kosovo would set a precedent in other parts of the world, Russia’s ironic and duplicitous attitude befittingly demonstrates the perplexity of the issue. While Russia did not support Kosovo’s secession from Serbia, it did support and recognize the independence of South Ossetia and Abkhazia just months later. Against this background, Russia in the intermission between Kosovo’s declaration of independence and the outbreak of armed conflict in Georgia in August 2008, at times sought to downplay the analogy. Russian officials even stated that the right to self-determination could not justify recognition of Kosovo’s independence. But when the armed conflict erupted between Russia and Georgia, Russian officials made explicit use of references to the Kosovo crisis of the 1990s, consciously mimicking Western rhetoric from that period. Taking this into account, the events surrounding the hostilities in Georgia raised remarkably more tangible contradictions in Russia’s already ambiguous position. Russia’s moves in Georgia obviously undermined its previous sovereignty-based arguments regarding Kosovo’s status, and clearly showed that its support for Serbia was based on self-interest. The impending threat to European security with the outset of the Crimean crisis in 2014 once again put Serbia-EU relations to a test. As the Russian government once again contradicted previous statements by using the “Kosovo precedent” as a justification for its actions in Crimea, the EU gave notice to Serbia that it expects prospective members of the EU to adhere to the foreign policy of the Union. However, the EU’s decision to support Kosovo’s independence made that task somewhat more difficult in this case, since Serbia relied on Russian support. Therefore, when the EU imposed sanctions on Russia in response to the illegal annexation of Crimea and deliberate destabilization of Ukraine, Serbia chose not to follow suit – perhaps as a way of “returning the favor”. The issue that arose between the EU and Serbia was therefore not only that of Kosovo’s independence, but also the intensification of relations with Russia. Russia’s key role in the UN Security Council thus connected the two states more than ever. By supporting Kosovo’s independence to such a degree, the EU in a political sense pushed Serbia further towards Russia, which like the EU is an influential external actor in that country. Surely this was not the EU’s intention – in fact quite the contrary – but due to the EU’s infinitesimal range of solutions to the status question, Serbia has been pushed further towards Russia. Considering the geographical proximity, pushing a country like Serbia towards an illiberal and politically strong external actor such as Russia, with which it in addition has close cultural and historical ties, might not seem like the brightest idea, since Serbia could end up politically marginalized or even isolated, and thereby present a greater threat to European security. In December 2017, Serbian President Aleksandar Vučić reaffirmed Serbia’s stance on the Ukrainian crisis, making it explicitly clear that Serbia does not intend to impose sanctions on Russia even though it wishes to continue its European integration process. However, by not complying with the EU’s expectations and by diminishing its Common Foreign and Security Policy, Serbia is clearly marginalizing itself further and contributing to the destabilization of Eastern Europe. How does the EU, then, make Serbia live up to its expectations? Europe for Kosovo: a solution to the imbroglios? Although indirect, the discernible political turmoil revolving around Kosovo’s independence has had an evidential impact on the security situation in Europe over the past decade. Moreover, the question of how the EU will make Serbia adhered to its foreign policy, and thereby help stabilize parts of Europe, remains. The interesting question here is, how can the EU convince Serbia that recognizing Kosovo’s independence is a step in the right direction towards EU membership and the only viable solution to the issue, when Cyprus, Greece, Spain, Romania and Slovakia have not done so? Since Kosovo’s independence seems to be the primary obstacle to a functional relationship between Serbia and the EU – especially since it has led to other serious disruptions among them – one might think that the EU could simply give an ultimatum to Serbia: Europe for Kosovo. Hence, in order to gain membership, which due to the country’s economic situation is urgently needed, Serbia would first have to recognize Kosovo’s independence. 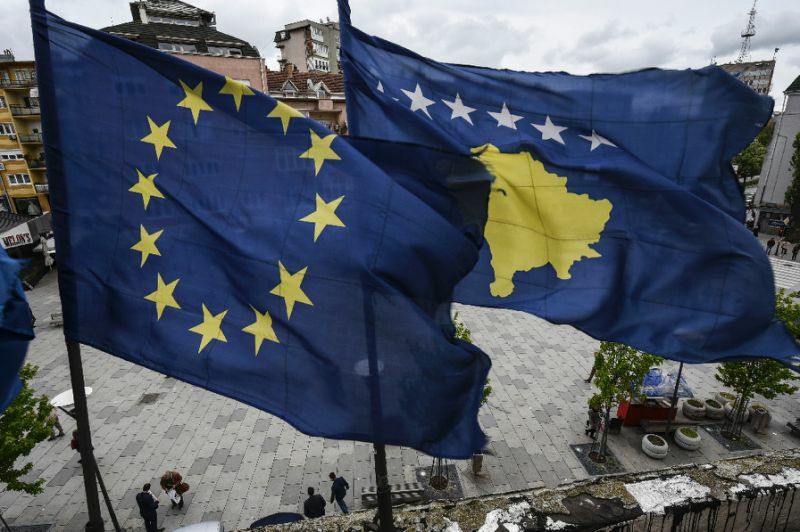 However, although the majority of EU member states have recognized Kosovo’s independence, the split among its members means that the EU cannot make Serbia’s recognition of Kosovo’s independence a condition for membership. This also means that the EU in this case cannot make use of the carrot-stick approach by offering incentives in exchange for full recognition of Kosovo. It is therefore rather clear that, although much of the responsibility regarding the solution lies in the hands of Serbia’s government, some responsibility lies in the hands of those EU member states that have not yet recognized Kosovo. This is undeniably a complex issue where the policies of the individual member states, prospective members, and the EU overlap and interact. It is first of all important to note that the abovementioned member states have not recognized Kosovo due to domestic minority issues and potential breakaway regions which allegedly pose a threat to their sovereignty. Yet, it is important to distinguish between the different cases and understand why the recognition of Kosovo’s independence was, and still is, necessary, as well as why there is no correlation between Kosovo and for example Catalonia, which often and most recently has been compared to Kosovo, and is the main reason for Spain’s unwillingness to acknowledge Kosovo’s statehood. Unlike Catalonia, Kosovo had dual status as an autonomous province of the Socialist Republic of Serbia and as an entity of the Yugoslav Federation, with similar rights as the six republics that made up the former Yugoslavia. Its special status and sovereignty was nevertheless violated in 1989 when the regime of Serbia’s former president Slobodan Milošević abolished the 1974 Constitution that secured the province’s autonomy, by overthrowing and handing over the authority in all its forms and at both local and provincial levels to Serbia. This eventually led to a humanitarian catastrophe during the dissolution of Yugoslavia in the 1990s and the threat of genocide to Kosovo’s ethnic Albanian population, which resulted in NATO’s military intervention in 1999. In comparison, Catalonia did not face the violent repression, crimes against humanity and ethnic cleansing by Spain as Kosovo did by Serbia. Does this, then, mean that the threat of genocide needs to be present in order to eventually achieve independence? It should be noted that in international law, the principles of state sovereignty and territorial integrity are well established and protected by a series of consequential rules that preclude interference within the domestic jurisdiction of states and forbid the threat or use of force against states’ territorial integrity. Thus, in the interest of systemic stability, international law has a bias against secession. However, it should also be noted that secession is not entirely prohibited by international law, which a number of facts related to this particular case clearly demonstrate: a majority ethnic group within an area with historically defined boundaries, that witnessed an international intervention with the intention to prevent a humanitarian disaster and potential genocide being caused by the predecessor state, with the support of a significant segment of the international community sought to achieve independence after negotiations with the predecessor state led to an unconditional deadlock. In this respect, it is safe to say that Serbia’s aggressive behavior towards Kosovo’s Albanian population warranted such a response by the international community. Thus, considering Kosovo’s recent history, it is rather difficult to imagine a fitting alternative to the solution, revealing that this is in fact a unique case and that Kosovo’s independence is in line with norms in international law, especially since it used to be part of a country that no longer exists. Moreover, by not recognizing Kosovo’s independence, the aforementioned member states are inadvertently equating the situation with their own, making it considerably clear that they are unable to distinguish between destabilizing separatism and legitimate aspirations for independence. For this reason, the sooner those member states understand that Kosovo is a unique case and that recognizing its independence is not going to influence their interior situation, the sooner Serbia could be pushed towards the realization that Kosovo’s independence must be recognized in order to continue its European integration process. This way Serbia’s relationship with Russia may also be weakened, which in turn may help bring Serbia closer to the EU – both in a political and normative sense. Consequently, this will allow Kosovo to gain membership in the UN and other international organizations, which could help Kosovo develop globally. A fully functional Kosovan state would furthermore lead to more security and stability in the Western Balkans. Vladislav Antonić holds a master's degree in Eastern European Studies from Aarhus University, where he specialized in the Western Balkans and European Union affairs. Vladislav has, among other places, practically applied his theoretical knowledge at the University of Novi Sad in Serbia as well as the Royal Danish Embassy in Zagreb, Croatia. His fields of interest include international law, international criminal law, international relations, geopolitics, and security and defense policy.